Installing your own domestic or commercial shade sail is a breeze. 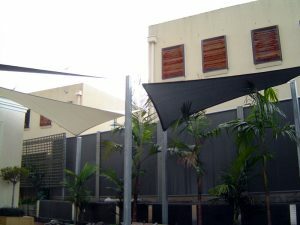 Whether you want a shading system to provide family protection over a domestic area such as your backyard, pool or deck, or if you need a commercial structure to shield a playground, sports area or school yard from sun and rain, Melbourne Shade Sails™ offers the best in design and construction to give you what you need. We’re a quality supplier offering all different sizes and dimensions of sun shades, as well as different shapes (such as square or triangle), so that no matter what you need, you’re sure to find the right product for you. UV inhibitors prevent harmful rays from penetrating the fabric, offering up to 98% protection no matter what time of day it is or how extreme the heat. These sun shades offer the ultimate protection against sun damage to the skin, such as sunburn and skin cancer, so that you can enjoy the outdoors all year round. Breathable materials allow cool air to circulate beneath the shelter of your shade sail, providing you with a comfortable and well ventilated space ideal for hot summer days when you need a bit of fresh air. Our shading systems also provide limited shelter from rainy weather to let you enjoy a dry outdoor space even in a light drizzle. To allow airflow, our shade sails are never completely water proof and should not be relied upon to protect items that are sensitive to water. Once you’ve purchased the perfect sun shades for your Melbourne home or business, it’s time to think about installation. This is an important process, as proper installation means that your shade sail will be at its most effective, and you are less likely to have maintenance problems later on. But if you don’t want to pay for a professional installation job, there’s another way to get the best results without the hassle of organising an expert to help. Our easy-to-use DIY options allow you to achieve professional installation by your own hands. We provide you with everything you need: posts, materials, fittings, structures and fixtures. We provide clear instructions to make installing your sun shade as simple as possible, with everything you need to complete your construction without any stress. By following the directions correctly, you can install your own shading system as perfectly as a professional, offering maximum protection and convenience. It’s simple: we want to help you, so our high-quality DIY installation options are reasonably priced, making your experience hassle-free. For professional results by your own hands, choose our comprehensive and easy-to-use DIY shade sail now. To get a FREE on-site measure and quote for sun shades in Melbourne follow the link below, or simply give us a call and speak to one of our consultants on 1300 99 32 37.